Hello all! How was the weekend? I am proud to report that the writing slump is over. I actually sat down to write this weekend. I'm quite happy to say that I'm back into the swing of things. 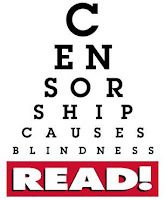 Instead of the opportunities today, I'm going to talk about Banned Books Week. 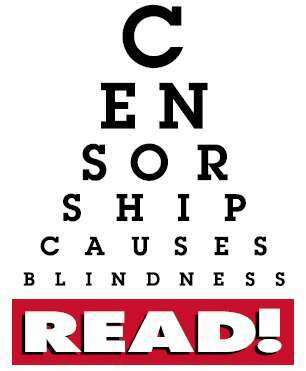 I am completely against censorship, particularly regarding books and music. I believe that people have the right to say what they want to say and everyone also has the right to not listen or to not read. Why go through such lengths to ban a book? I learned about banned books week last year, towards the end when it was pretty much over. This year I spent a little time looking over the list of banned books and I couldn't believe how many books on the list I was familiar with and even read. I'm disgusted quite frankly. My mother was strict with what I read, but she never went to the extent that some of these parents are going. I recognized a great deal of books that I was actually required to read for school. Good books. I just recently used Push in my thesis for my MFA. I read that Roll of Thunder Hear my Cry was on the list because a woman in Seminole County Florida "objected to its depiction of Southern racism, which she considered inappropriate for kids." This one really hit close to home because I was required to read this book in the seventh grade, a year after a classmate called me the N word in the sixth grade. What that woman doesn't understand is that there are some kids enduring the things that are written in that book. There's also more of an official list and I'm willing to give away a banned book from that list as well. You can find that list here. The three winners will each receive one banned book of their choice. All you have to do is comment on this post (include your email) and you have until Wednesday October 12, 2011. (If you're not comfortable with leaving your email, then leave a link to your blog. If you don't have a blog, email me at writer106@yahoo.com.) I'll announce the winners on Friday October 14, 2011. Also, You MUST be a follower of my blog but it doesn't matter if you're new or old. No need to tweet or blog about the contest but they are both greatly appreciated. Good Luck! I love all the support that's been pouring from the blogging community for banned books. Thanks so much for the giveaway! I hear you on this. I was surprised to find Beloved, as well as a few others on that list. If your giveaway is international, add me or I can give you a U.S. address if I get lucky. I completely agree with everything you've said. What an awesome idea for a giveaway! I love how the blogging community comes together in support of Banned Books Week. Beautiful post, Racquel. I didn't know Roll of Thunder was banned. Are you serious? I loved that entire series! Some of my favorite books are banned ones. What a fantastic giveaway! Thanks for doing the giveaway! I love reading banned books.